Discussion in 'Missouri Race Tracks' started by Race Results, Mar 19, 2019. Steve Keller has been a racing fan for more than 20 years. The Polk County native fondly recalls attending the races at Bolivar Speedway back in the days when the legendary Larry Phillips was winning championships. Over the years, Keller has been able to combine his skills as a long-time paramedic and emergency management director with his passion for motorsports. He's been Emergency Engineer in Charge at Lucas Oil Speedway since 2012, directing the emergency crew at the track. With a staff of 10-12 overall and a typical crew of five of those working most race nights, Keller's team not only is there when needed for on-track racing accidents but also for spectators who might need medical assistance. "We're there to just try to make the experience as enjoyable as we can for everyone and be there in case something does happen," Keller said. 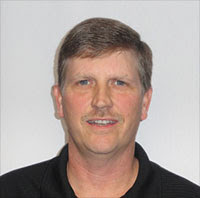 Keller was hired at Lucas Oil Speedway seven years ago when then-General Manager Dan Robinson posted a job for an Emergency Engineer in Charge. Keller, who had been going to the races at the speedway, saw it as a natural fit. A paramedic at Citizens Memorial Hospital in Bolivar for 29 years, Keller said he got into his profession because "I like helping people." "That's what got me into being a paramedic," he added. "I had been around racing and liked it. I was looking to do something part-time and this opportunity came open. "I enjoy it when all the different series come in. Each is a little different. Each series, when they come in, I sit down and talk with their safety directors, then I get together with my crew and we go over the ins and outs of each event." The on-track safety crew is like a finely tuned machine with each member knowing his role. Speed is of the essence, especially when fire is involved. That can be especially challenging with Sprint cars, when flame from the alcohol-fueled machines is not clearly visible. Best of all, major incidents at the speedway have been few and far between. "I think that goes back to the safety of the track and some of the rules in place," Keller said. "My guys go through the cars, especially at Test and Tune, so any new guys we bring on can see where the potential of the fire is and the best places to attack the fire. Or, if we have to take the car apart, where we can cut into it quickly. "All my guys who work on the track are from either full-time paid fire departments or were from fire departments. So they know the fire side of things." Helping people clearly is a Keller family trait. Steve's wife, Cassandra, is a paramedic in Stockton and also fills in on the Lucas safety crew. His son Zack is a member of the Springfield Fire Department and also works on occasion at the speedway. Daugther Kortney is a nurse in Columbia. Keller also has two stepdaughters, Elena and Hanna, who attend Stockton High School. Lucas Oil Speedway General Manager Danny Lorton said it's comforting to know that Keller and his emergency staff is on hand. "Those guys are outstanding in their response, when needed," Lorton said. "They really are second to none." Lucas Oil Speedway is considered by fans, drivers and industry insiders to be one of the top five racing facilities in the nation. Located in Wheatland, Missouri, approximately an hour from Springfield, Missouri, and just an hour and a half from the Kansas City metro area, the "Diamond of Dirt Tracks" lives up to its title. Twenty-One VIP Luxury Suites, HD Jumbo-Tron Screen, Stadium Style Musco Sports Lighting, a Bose Sound System, Go-Kart Slick Track, The Diamond Bar, Track Treasures Gift Shop, the best track food in the country and paved pits are a few of the spectacular amenities setting the Diamond of Dirt apart. This year marks the ninth season for the Liquid Quarter Mile Drag Racing Lake, "Lake Lucas." New for 2017 was all-purpose built Off Road facility featuring the Lucas Oil Off Road Racing Series as well as a host of other regional events. Lucas Oil Speedway's dirt oval track plays host to some of the largest and most-popular events in the Midwest with national and regional touring series appearing frequently including: The Lucas Oil Late Model Dirt Series, POWRi Midget National Series, Lucas Oil Pro-Pulling League, United States Modified Touring Series, ASCS Sprint Cars and the Lucas Oil MLRA. 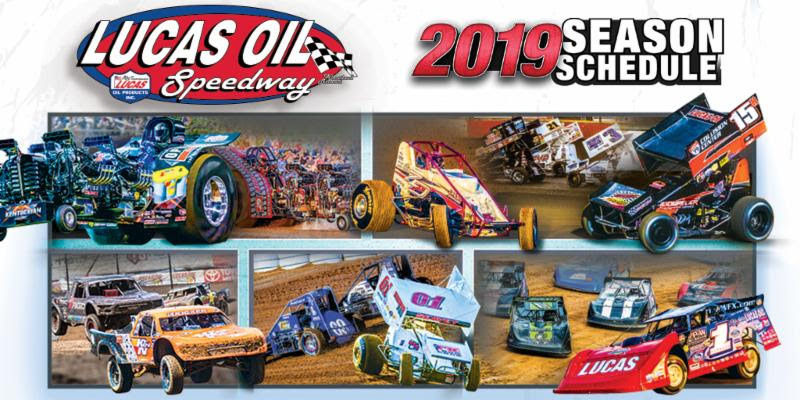 In addition to the special events, the Lucas Oil Speedway Big Adventure RV Weekly Racing Series features the Warsaw Auto Marine & RV ULMA Late Models, Pitts Homes USRA Modifieds, O'Reilly Auto Parts Street Stocks and the Ozark Golf Cars USRA B-Mods.